The end of February is when Winter starts to soften a bit, and up here in these Northern parts, that also means the gradual introduction of two additional events: the introduction of “mud season” (in which the local dirt roads become almost impassible due to the combination of melting snow, poor drainage, and frost heaving), and “maple season” (in which you drive down those same muddy roads visiting shacks emitting large amounts of steam, in which maple sap is being boiled down). It’s a fun time of year, and quite a few places make a pretty big to-do of it. Vermont and New Hampshire, for example, have sponsored Maple weekends when you can go touring around, but our friends over the border in Quebec take things a lot more seriously (primarily since Quebec produces far more maple syrup than anywhere else, even if some of it occasionally gets heisted), and several large sugaring operations in Quebec host elaborate “Cabane à Sucre” celebrations, usually with copious amounts of food featuring maple. 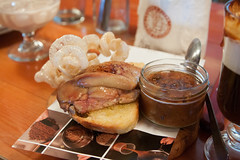 But there’s one of these that outdoes all the others: Cabane à Sucre Au Pied de Cochon. 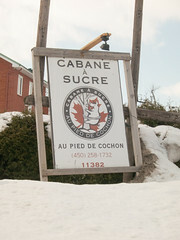 Located in a large sugarhouse in St Benoit de Mirabel located about 45 minutes Northwest from Montreal, this Cabane à Sucre is special, since it is run by chef Martin Picard from Montreal’s Au Pied de Cochon, a culinary establishment already famous for it’s excess, such as cramming fois gras into almost every dish imaginable (you can read my review of the main establishment here). Twice a year, Au Pied de Cochon does special festivals up at their sugarhouse: one in the winter for maple sugar season, and another in the fall for the apple harvest. Both are legendarily difficult reservations to get: the maple dinner reservations open up on a first-come-first-served basis at midnight on 1 Dec every year, and fill quickly. Twice, the act of merely waiting until sunrise on that morning to fire up the web browser resulted in my being waitlisted, far enough down that I never made it to the top. But this year I set my alarm, and soon got a call that I was confirmed for brunch on 23 February… A week after we got back from our (excessive) Hawaii trip. After a pleasant drive through the mostly-open plains of Quebec (I’m still always amazed how much the geography changes crossing from Vermont into Quebec. It’s like someone flipped a switched and you got transported to some sort of French-speaking Iowa), you arrive in the Maple forests near Mirabel at a reasonably large sugarhouse. 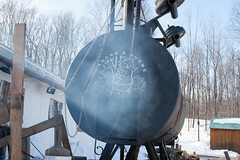 Pulling into the parking area, one of the first two things you smell are maple and smoke. When we showed up, they weren’t yet sugaring for the season, but they did have a giant smoker out front, and were finishing up some maple-glazed duck breast (more on that later). 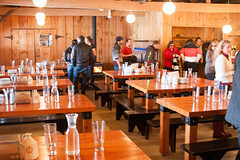 Walking inside, the interior is a surprisingly nice dining area, primarily with large wooden tables (the primary seating at the Cabane à Sucre is at a table of 8, with food served family-style, although they’ve got a bar as well for smaller parties, such as our party of two), and more than a little “North Woods” decor, like stuffed coyotes in the rafter. 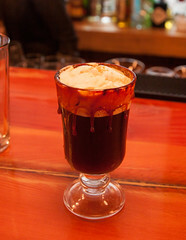 Sitting down at our spot at the bar, we were quickly welcomed by the bartender who offered up a series of maple beverages for us, such as my maple coffee cocktail rimmed with molten maple sugar. But, after about 10 minutes of enjoying our beverages, the food started to arrive from the kitchen. 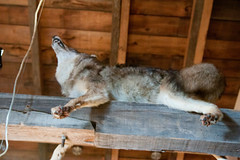 The Cabane à Sucre dinner is served in several pairs of courses, arriving from the kitchen at approximately 20 minute intervals. So we soon found ourselves with a series of starters. First was the foie gras. You can’t do a meal at PdC without at least a little foie gras happening, and here they opened with it: toast with some excellent maple-seared foie gras and fried pork rinds. This was a rather pleasing foie fras, the maple adding just enough flavor to make the dish pleasantly maply without making it too sweet. This was paired with baked beans which, on the other hand, were solidly maple-infused, which actually works well for baked beans. 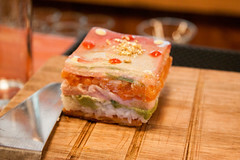 The other half of the first course was was a funky terrine of layered avocado, salmon tartare, beet puree, beet jelly, and rice. Basically, this was a flat-style sushi roll in both conception and execution. This was probably my least favorite course, since it was a bit odd in flavor combination. I’m not a terribly huge fan of heavy “fishy” flavors, and to my palate, this dish tended to emphasize the fishier aspects of the salmon, tasting mostly like salmon skin, while usually I find that sushi-style preparation is designed to minimize those sorts of flavors. I think if I my palate was a bit different I would have liked this course, but mostly this seemed a bit off to me. That said, it wasn’t bad. Just different. Right was we had started to come to grips with the first round, the second round of food arrived. 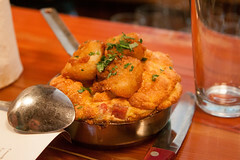 The first half of this course was a soufflé omelette with chorizo and potatoes on top. Soufflé’s generally aren’t my thing, but this worked quite well for me: the chorizo and potatoes on top were particularly pleasant, with more than a little spice and garlic, and the soufflé was quite nicely done, with a nice, fluffy texture. The result was a dish that enjoyed a lot more than I would have thought, although even this early in the meal I was learning that I would have to pace myself a bit. 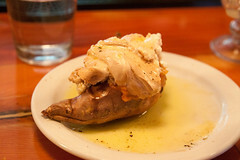 Next up was another dish that I normally wouldn’t go for: sturgeon quenelle (I should note here that figuring out exactly what this dish was required consulting a few other blogs, since the waitstaff at the Cabane à Sucre speaks rather good conversational English, but were often quite limited when in came to explaining haute cuisine, so often the descriptions of dishes as they arrived were vague and mostly left us nodding quietly). 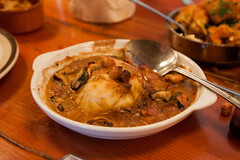 Basically this was a light, fluffy sturgeon puff served in a mussel sauce. While sturgeon is near the bottom of my list of favorite fish (see my comments above on ‘fishy’ flavors, combined with my mild fish allergy), but again, the execution here was quite good: the sturgeon was actually rather light and smooth, and the sauce rich and savory. …which was ham. This was an excellent ham that they had smoked in the smoker outside, wrapped in damp hay. That gave the ham a nice, musty smoke flavor that worked surprisingly well, and was quite pleasant. This, some of the mustard, and a bit of the duck pancake made for a nice sandwich-like approach to eating. 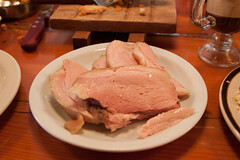 That said, this is one place where sitting at the bar, we didn’t get the full presentation of this dish, a modest production involving rolling the ham out of the kitchen on a cart with the hay, ringing a cowbell, and carving up the ham to order. That said, we got to see most of the other tables get their ham. Served alongside the ham was a pair of sweet potatoes served up with house-made maple marshmallows, and while I generally don’t go for sweet potatoes with marshmallow, with the ham they made a particularly nice side, and were actually one of the less heavy dishes of the day. 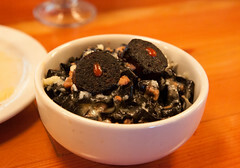 Another item brought out at the same time was a bowl of squid ink pasta topped with black pudding. Another pleasant dish, the squid ink pasta was actually more mild than I’m accustomed to, served up in a creamy garlicky sauce that was quite nice. The star here, however, was the black pudding, which was excellent, with a deep, rich, bloody taste that I really haven’t experienced nicely since Spain. I’d easily get a whole plate of that if it was an option. Next up was probably the most featured dish: Duck breast stuffed with various duck innards. 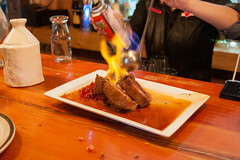 This came out from the kitchen with a flourish, and was flambéed by the waitress. This dish was a bit of a mixed bag. I really enjoyed the stuffing, made from a mix of crumbs and all sorts of duck innards, and was quite tasty. The duck breast itself, while having a wonderful crispy maple skin and having a great stuffing, was actually a little on the tough side. This was actually a bit disappointing, since otherwise this was a great dish, but it was actually hard to eat. Having had smoked duck breast a few time, I know that it’s hard to get duck right, but I was hoping for something a bit better executed than this. 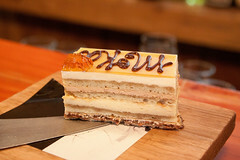 Finally, it was time for dessert, which was actually four different dishes. The first was an elaborate multi-layer mocha cake, which I rather enjoyed, with a really bold coffee flavor to it that nicely countered the sweet-but-smokey maple note that pervaded most of the meal. 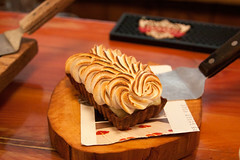 Also enjoyable to me was the banana, with a very rich banana maple filling underneath a perfectly-crisped meringue. 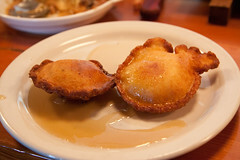 This reminded me of the banana “hobo pies” we’d make over campfires. Finally, sugar on snow (served up as little lollipops… I prefer the more classic presentation where they ladle it out in a little trench in the snow and you roll it out around a stick…), and some maple yogurt that was actually on the tart end of the spectrum, making for a nice pairing with the otherwise powerfully sweet desserts. Overall, we loved the Cabane à Sucre, and were not only grateful to have finally had the experience, but we’d definitely do it again. While not everything was exactly to our tastes, we actually enjoyed having our culinary boundaries pushed a bit, although one or two of the dishes I’d pass on having again. That said, if we do this again, there are a few lessons I learned: first, that you really, really, need to starve yourself before coming here. This was easily the most excessive multi-course meal I’ve ever been served, and the vast majority of the pictures I’m showing here are just my portion of the meal (with Carol having a similar-sized serving). Despite lean eating for two days beforehand, I was barely able to polish off a third of the food (and you can’t take a doggy bag back into the US…). The second is that while the bar seating had a few advantages (it was distinctly less cramped than the tables…. a boon for food photography), in generally the tables got a more complete experience: ham carved to order at the tables, a full presentation of a foie gras “cake” instead of just toast, etc. That, and bringing a bunching of friends allows a bit of averaging to happen: some of the courses I didn’t really care for I could have given extra to other diners, and I could have likely had more of some of the courses I really enjoyed. But overall, this was a splendid experience, and worth the logistical challenge and caloric hit. Perhaps next time you need to take a full group and get a table…… If I stop eating now I’ll be just about hungry enough to take part. Before I get into the actual restaurant reviews, one more post is in order to give some background on Réunion’s culinary traditions. First, the food. Reunion is really a culinary delight. The mix of cultural influences from France, Madagascar, India, China, Portugal, Indonesia, and other locals makes for a particularly vibrant mix of ethnicities, often all blended together in the same meal. Add in the fact that the island has a shockingly wide range of agricultural products of their own (guava, papaya, banana, sugar cane, pineapple, chayottes, and mangos in particularly all grow like, and sometime as, weeds, and there’s a strong spice industry as well) makes for some particularly great, and sometime unique, ingredients to work with. There’s also enough French influence (the island is actually part of France, not a colony) that if you are on an actual road, you are also guaranteed to be never more than a 20 minute drive from a decent boulangerie or patisserie, even when in the middle of the island in the mountains.